CONS: …what I actually mean is, melted at some point, quite a long time before arriving at my table. Congealed. Bendy. 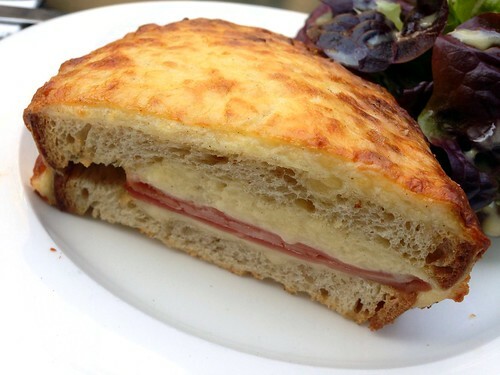 This was, without a shadow, the worst croque monsieur I have ever eaten. 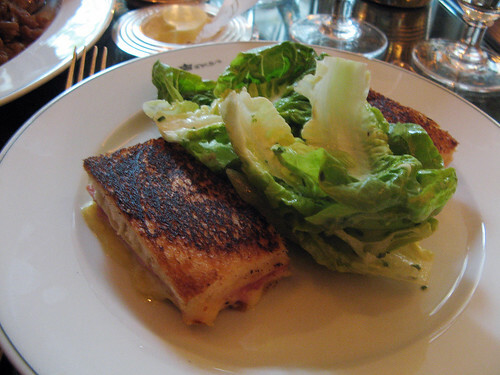 So, instead of delivering a croque monsieur, The Delaunay decided to deliver a game. The game was called: ‘Find The Croque Monsieur Under a Big Pile of Salad Ha Ha Ha Sucker!’ What the actual piss take is a mountain of (under-dressed) baby gem doing on top of my sandwich? Oh and the sandwich is TINY, by the way. I put the two halves together and they did not amount to a full sized slice of white bread, even with the crusts removed. On the inside was a really generous amount of spectacularly poor quality ham; you know, the shiny kind. The Gruyère was a very poor example – apologetic, pathetic. The whole thing was blistering hot on the outside and stone cold in the middle. The bread was so greasy it reminded me of a caff I used to visit in Oxford where they deep fried everything, including the sausages and bacon. In short, I didn’t rate this sandwich. The Delaunay is a lovely room however. They can have one point for that and one more for the waitress, who was charming and brought me a Martini.